Kapotte Muziek is an electro-acoustic trio of Frans de Waard, Peter Duimelinks and Roel Meelkop. They play live concerts and never make studio recordings. During live performances Kapotte Muziek explore the minimum input of acoustic sound to a maximum extent. All sounds originate from obsolete materials that are found in the course of their activities. Every performance is preceded by a ‘junk search’ to obtain new sound material. That way they have used metal, wood, paper, plastic, glass, stones etc. Every object is thoroughly explored for its sound qualities, amplified either by microphone or by contact-microphone. This is combined live with pre-recorded sounds of acoustic, environmental and electronic origin. In this line-up Kapotte Muziek exists since 1995. 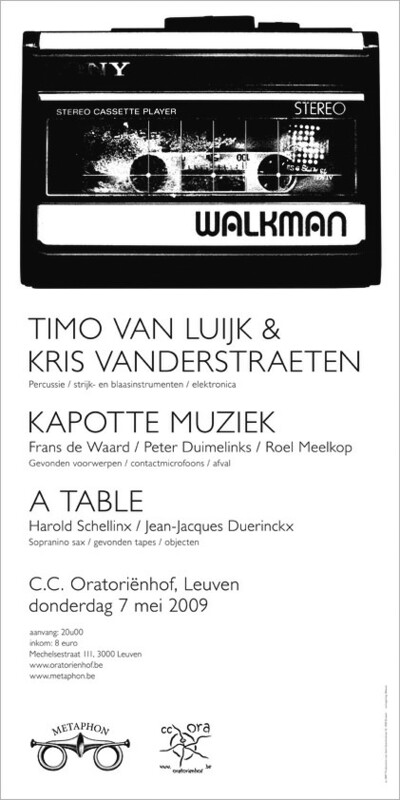 From 1993 to 1995 Kapotte Muziek were just Peter Duimelinks and Frans de Waard. Duimelinks and Meelkop are also a member of THU20 aswell as actively involved as solo musicians. De Waard also plays with Beequeen, and solo as Freiband and Shifts. Since 1993 Kapotte Muziek have played nearly 100 concerts around the world, including the USA, Canada, Japan and most European countries. They have played art-galleries, museums, squats, radio stations and rock clubs. From 1984 up to 2003 Kapotte Muziek was also a solo studio project by Frans de Waard, who as such released a whole bunch of cassettes, LPs, CDs and CDRs on his label Korm Plastics. “A TABLE !” are Harold Schellinx (nl/fr) and Jean-Jacques Duerinckx (be). In their performances the duo uses locally found objects for the setting and decoration of a table, which subsequently guides them in a sonic post-alter free style adventure, dedicated to Daniel Spoerri. Harold Schellinx is a mathematician, musician, performer, writer and media-artist. He is editor-in-chief of PARK4DTV’s ‘Raudio’ half of the dutch duo ‘ookoi’, founder of the parisian EAI quartet ‘Diktat’ and much more besides. One finds detailed documentation on his work (words, images, sounds) on his web site ‘harsmedia’ and in the extensive reports of the SoundBlog. Jean-Jacques Duerinckx uses the sonic matter of his principal instrument, the sopranino sax, as an energy vector providing the major anchor point for his artistic expression. He is a partner within divers musical enterprises, such as Zohara, with singer Zahava Seewald, Panopticon, and the brass band Rambibambo. Timo van Luijk is an autodidact sound artist/improvisor active since the late 80’s. He was co-founder of the improvising multi-media collective Noise Maker’s Fifes and has been developing his solo project Af Ursin, with various releases mainly on his own imprint La Scie Dorée. Van Luijk works with an eclectic variety of discarded acoustic instruments bringing more life into sound/music. He has been involved in various concert and studio projects with a.o. Raymond Dijkstra, Christoph Heemann, Limpe Fuchs, Frederik Croene and he’s part of the group Onde. In 2007 he started the organisation Metaphon with Greg Jacobs and Marc Wroblewski (both from Noise Maker’s Fifes and Onde). Percussionist Kris Vanderstraeten has been active in the Belgian free improvisation scene since the 70’s. As he has constantly been modifying his percussion set (with extensions) he developed a very personal sound balancing between the boundaries of free improvisation and abstract soundart. He has been working with a.o. Daniel Vanacker, Mike Goeyvaerts, Jacques Foschia and is member of the succesfull trio Sureau with Jean Michel van Schouwburg and Jean Demey. Apart from his musical activities Vanderstraeten is also a prolific graphic artist with countless handdrawn jazz concert posters and albumcovers on his credit. Vanderstraeten started playing with Timo van Luijk in the mid 90’s. Through their long and intense collaboration the duo created a very personal language within the field of electro-acoustic improvisation. 2 fascinating albums got released on van Luijks label La Scie Dorée with artwork by Kris Vanderstraeten.